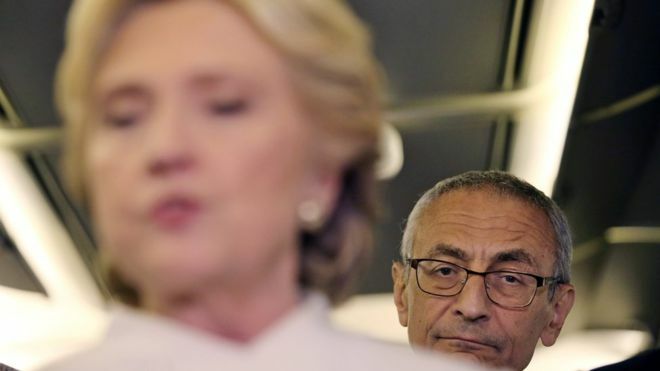 Today marked the twentieth release of hacked emails from John Podesta, the Chairman of the Clinton campaign from WikiLeaks. Over the past few weeks WikiLeaks and Jullian Assange have been releasing tens of thousands of emails from the former Chief of Staff to President Bill Clinton, though the Clinton campaign have not verified any of the released emails. Also, our contributions to the Christian Science Monitor continue this week with The Politics of US: Healthcare. Use the AllSides topics page on healthcare for background, news and dialogs, and check out our new school lesson plan for healthcare, our latest addition to AllSides for Schools. See other news featured by AllSides such as The Race Tightens, Megyn Kelly vs. Newt Gingrich, Obamacare Premiums to Rise Sharply and the latest AllSides News. "Newly released emails published by Wikileaks show Hillary Clinton’s presidential campaign admitting President Obama knew about Clinton’s use of a private email address during her time as Secretary of State, despite Obama saying he did not know about it until he saw it on the news. Cheryl Mills, an aide to Clinton, replied to the email to Clinton national chairman John Podesta by saying 'we need to clean this up,' confirming Obama received emails from Clinton that were not state.gov emails." "On the day the news broke that Hillary Clinton had used a private email account as secretary of state, the man who would soon be named to chair her presidential campaign fired off a note of distress, venting frustration about some of Clinton’s closest aides. The emails show that while aides struggled to get past the public controversy, they also expressed exasperation at each other and, at times, at Clinton — both for her decision to use the server and for the way she handled questions about it. Several exchanges illustrate fears among some top advisers that Clinton and other aides were demonstrating the very traits that polls suggested made her vulnerable: a penchant for secrecy and a hesitancy to admit fault or error." "Amid the campaign strategy, snide comments and other headline fodder culled from the hacked accounts of Hillary Clinton's campaign chairman, John Podesta, and groups including the Democratic National Committee, the emails include the private information of a large number of bystanders, ranging from email addresses to financial data. The Clinton campaign has refused to confirm or deny the authenticity of any of the emails and has accused WikiLeaks of working with the Russian government in releasing them. WikiLeaks and the Russians have denied the charge, though US officials have pointed the finger at Moscow for meddling in the US election through cyberattacks. Now for more than two weeks, WikiLeaks has each day dumped thousands of unredacted emails online and shows no signs of letting up."